"GET EXCITED about Single Stream!" trills the flyer that comes in the mail from Town Hall. A letter from the commissioner of public works hails the "exciting change" beginning next month, when town residents will no longer be required to sort their recyclable trash into separate blue bins -- one for paper, the other for cans, bottles, and plastic containers. Instead recyclables will all go into 64-gallon "toters," which will be emptied at curbside on trash day into "single compartment trucks" using "automated equipment." But for some reason the excitement of this eludes me, so I turn to the enclosed information sheet. A list of "frequently asked questions" and a letter from the town's Solid Waste Advisory Committee -- and what would town life be without one of those? -- assures me that single stream does away with "guesswork," making trash-disposal easier than ever. "By eliminating sorting," it reports, the new system may boost recycling rates by 30 percent or more. In large boldface print, it urges: "Get Excited!" I gaze at the brightly-colored "Single-Stream Recycling Guide," with its illustrated array of trash items that can all go in the "toter" without sorting. There are pictures of bottle caps and egg cartons, books and tin cans, plastic jugs and newspapers. "All Together Now!" the leaflet proclaims. Hmm, I think, maybe this will be an improvement. Then I start reading the fine print. It turns out that when the town says it is "eliminating sorting," what it means is that glass bottles and jars can be recycled, but not drinking glasses or window glass. 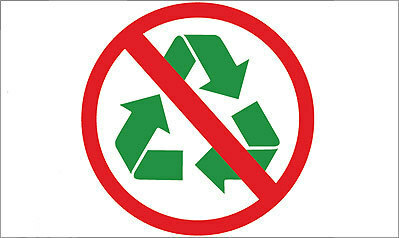 It means plastic tubs are OK to toss in the toter, but plastic bags aren't. It means that while cardboard boxes must be flattened, milk and juice cartons must not be flattened. Reams of office paper are fine, but not the wrappers they came in. Tinfoil should be crushed into balls of 2" or larger; tin cans shouldn't be crushed at all. 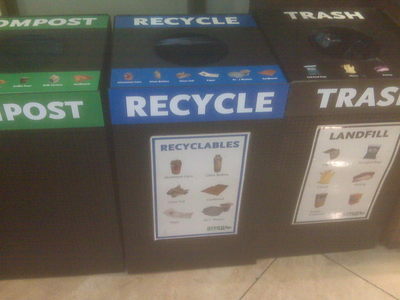 "Please follow these guidelines carefully," the recycling guide directs. I don't think the Green Police will haul me off in handcuffs if I try to recycle an ice cream carton or a pizza box, but the town has warned that "there will be fines" for residents whose "recycling protocols" don't measure up to "basic community standards." To be fair, things could be worse. Clevelanders will soon have to use recycling carts equipped with radio-frequency ID chips and bar codes, the Plain Dealer reported last month. These will enable the city to remotely monitor residents' compliance with recycling regulations. "If a chip shows a recyclable cart hasn't been brought to the curb in weeks, a trash supervisor will sort through the trash for recyclables. Trash carts containing more than 10 percent recyclable material could lead to a $100 fine." In Britain, where a similar system is already in place, fines can reach as high as $1,500. San Franciscans, meanwhile, must sort their garbage into three color-coded bins -- blue for recycling, green for compost, and black for trash -- and scofflaws who pitch teabags or coffee grounds into the wrong bin can be fined. In other cities, residents must bag their trash in clear plastic, lest they be tempted to toss recyclables out with the garbage. Does any of this make sense? It certainly isn't economically rational. Unlike commercial and industrial recycling -- a thriving voluntary market that annually salvages tens of millions of tons of metal, paper, glass, and plastic -- mandatory household recycling is a money loser. Cost studies show that curbside recycling can cost, on average, 60 percent more per ton than conventional garbage disposal. In 2004, an analysis by New York's Independent Budget Office concluded, according to The New York Times, that "it cost anywhere from $34 to $48 a ton more to recycle material, than to send it off to landfills or incinerators." "There is not a community curbside recycling program in the United States that covers its cost," says Jay Lehr, science director at the Heartland Institute and author of a handbook on environmental science and technology. They exist primarily to make people "feel warm and fuzzy about what they are doing for the environment." But if recycling household trash makes everyone feel warm and fuzzy, why does it have to be compulsory? Why the fines and computer chips? Mandatory recycling programs "force people to squander valuable resources in a quixotic quest to save what they would sensibly discard," writes Clemson University economist Daniel K. Benjamin. "On balance, recycling programs lower our wealth." Now whose idea of exciting is that? Next: Is recycling really good for the planet?